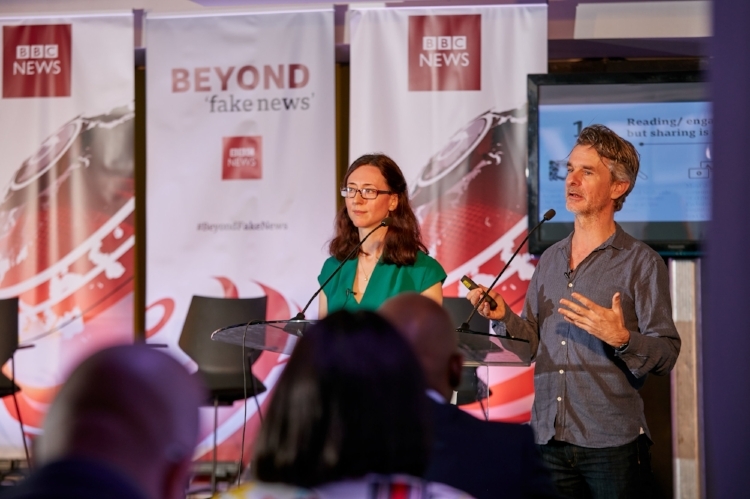 Research by Flamingo has informed a major report released by the BBC World Service Audience Insight team as part of Beyond Fake News, the BBC’s new international anti-disinformation initiative. Flamingo’s senior director, David Burrows (pictured) presented the research at a launch event in Nairobi. The report, Verification, Duty, Credibility: Fake News and ordinary citizens in Kenya and Nigeria, is part of a wider international project that also covers India. It explores how fake news is spreading within encrypted chat apps like WhatsApp, and reveals that “emotion is trumping reason when it comes to sharing news”. The report is the first published study analysing the spread of fake news from the perspective of ordinary citizens. Flamingo’s people insight team carried out in-home qualitative interviews across three cities in Nigeria and two in Kenya to gain a detailed view of their behaviour and motivations around sharing fake news. Flamingo’s semiotics team analysed academic literature on fake news, alongside the sources provided in-field and from the research team, to understand the structure and executional techniques of fake news. They specifically examined visual style, executional techniques, how fake news conveys authority, and how fake news promotes shareability. The report reveals that people in Kenya and Nigeria are consuming mainstream media and known sources of fake news in equal amounts. This is caused by a number of factors: being seen to be ‘in the know’ has great social cachet so people are concerned about falling behind on the news and this allows fake news stories to slip through the cracks. A sense of duty is also large driver of the spread of fake news in these countries; people feel bound to share breaking news in case it turns out to be true and could affect people in their networks, as well as feeling a sense of duty to democratise access to information. Fake news is also unwittingly spread in the hope that someone else will check its veracity. The types of information shared most widely varies by market. In Kenya and Nigeria, the most shared fake news stories largely reflect national anxieties and aspirations, with scams related to money and technology contributing to around a third of fake news stories shared via WhatsApp in Kenya. In Nigeria, stories relating to terrorism and the army are also widely shared. Dr Santanu Chakrabarti, Head of Audience Research, BBC World Service, says: “At the heart of this research is the question of why ordinary people are sharing fake news, even while they claim to be worried about the way fake stories spread. This report combines in-depth qualitative and ethnographic techniques with digital network analysis and Big Data techniques to explore the fake news phenomenon in India, Kenya, and Nigeria from multiple angles.